Last summer, our family sold our house, packed all our things, and moved across the country. The military had brought us to Northern Virginia over 10 years ago, but Texas is where we’re from and has always been home. I knew we’d move back someday… I just didn’t know that it would be three short years after I started a successful photography business in Virginia. When the conversation began between my husband and me, we quickly addressed this. I was a military wife and stay-at-home mom for years, which I cherished, but after starting my business, I had a job that I loved, too, and I wasn’t ready to say goodbye to it. I couldn’t leave it all behind, so I made a plan. My husband was very supportive. First, I spoke to the directors of the preschools that I photograph in Virginia and assured them that I would continue to be their photographer. They thought I was crazy but were happy and wanted me to continue. Next, we set dates for the fall photo sessions, I booked flights, started reaching out to friends and established clients, set a schedule, figured out sleeping and transportation arrangements, and I was off! My trip to Northern Virginia would be 14 days—with 12 full days of shooting. On the first day, I photographed 13 families. The next day, over 45 children… and so on. By the time I left, I had taken 13,000 images. With early mornings and late evenings (for good light), and many hours a day on my feet, mulch in my hair, and grass stains on my yoga pants, I was having so much fun. Before I knew it, I was back home in Texas, going through and finishing all the photos. With the arrangements I have with the schools, I rarely communicate in person with the parents. Following the mini-sessions, the finished photo albums go out on a website. I have a simple price sheet and parents have the option to purchase digital images that they can access immediately. This way, I am able to do all of the back-end work from my home in Texas, and my clients notice no difference from when I was in Virginia. When all was said and done, my business brought in $19,700 from 12 days of shooting, and in six weeks total (including choosing photos, processing them, and delivering them). On top of that, while I was in Virginia for the shoots, I was able to pick up another preschool, which has 120 children enrolled. Next time, I’ll likely photograph around 175 children at that school alone. Now I’m getting ready to head back to Virginia for spring sessions (by appointment only), along with some family and headshot sessions. Spring typically isn’t quite as busy as the fall, but it’ll be well worth it. Thankfully, even though I relocated to Texas, my Virginia business is still alive and thriving! Why do I think my business has been successful? I organize as much as possible on the front end, I communicate with clients, I find out what they want to capture from each photo shoot, and I TALK to the little kids during the sessions and explain who I am and what I’m doing. Most children have never even seen a camera that big! I show them their photo in the back of my camera, and we have fun and capture beautiful images together. I shoot fast, keep my pricing simple, and offer only a few options. I manage expectations and my customers receive their galleries on time. If a client ever has a complaint or concern, I will fix it, no matter what. I stick to my prices, but I am fair. 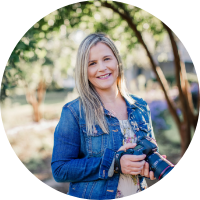 I always make sure that each and every person on the other side of my camera is as comfortable as they can be, whether it’s a two-minute mini session or a three-and-a-half-hour family session. I plan to continue traveling to Virginia for the foreseeable future, and eventually start sharing my love for photography down in Texas. Either way, I love what I get to do.